I awoke this morning feeling a familiar restriction in my chest. Asthma held at bay a part of the air I depend upon to breathe. My rescue inhaler, acquired from someone else, read fourteen more puffs of relief medicine. I haven’t had health insurance in nearly ten years. Prior to Obamacare, also known as the Affordable Care Act (ACA), I received health care on a sliding scale at the municipal hospital–a place where waiting for service takes up the vast majority of the appointment. Since November, I have been on a long, arduous journey to obtain the promised affordable care of the ACA through my state’s health exchange. I live in a blue state so our exchange is fully realizing the vision of Obamacare. But it’s a vision obscured by bureaucracy and tattered with holes that I struggle to not slip through in the process. Early in my attempts on the state exchange website, the system did not recognize me. 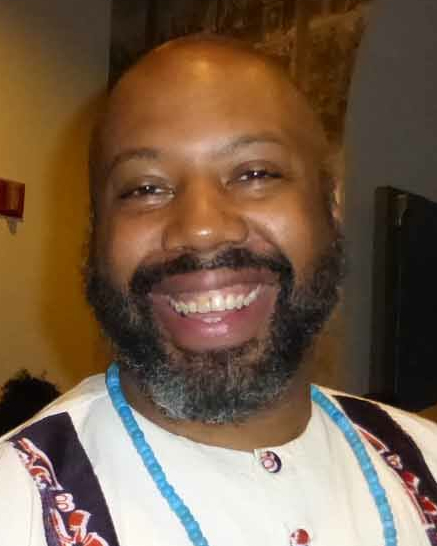 Being Black, bisexual and male, I found the experience of being unrecognizable quite familiar. But I persisted. A couple of call center conversations led me to create several accounts–each an attempt to try a different suggested strategy. Finally, a call center operator told me I needed a state ID number through our Department of Motor Vehicles. 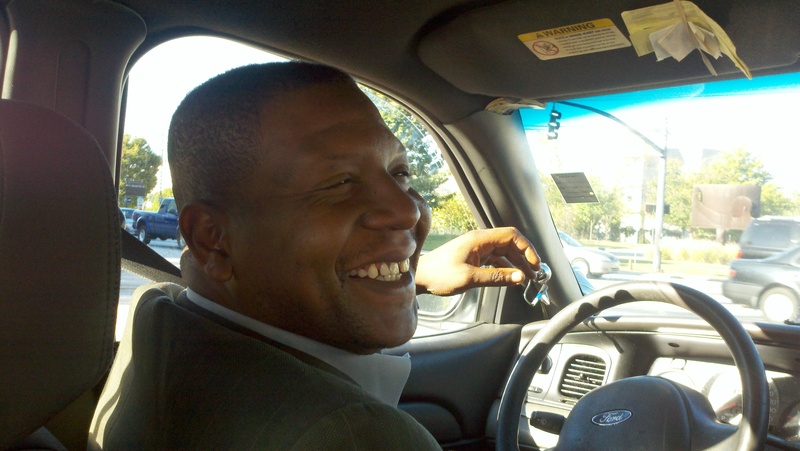 I don’t have a drivers’ license nor non-drivers’ ID but I used to have a learners’ permit. DMV told me the ID number attached to the permit was still associated with me but in order to obtain it I would have to file a form and pay a fee. At that moment, the no-fee sign-up promise of ACA disintegrated for me. I began a hunt for the old, expired permit among my papers. I didn’t find it but I did find the one and only receipt of my failed drivers’ test with my state ID number on it. A final account registration with my no-cost, retrieved ID number granted me recognition and access to complete an application. I hurriedly did so, eventually finding out that the exchange determined me ineligible to obtain ACA-supported health insurance until they conducted an income verification. As a member of the contingent faculty class, my income does not fit into the neat little box of standardized, continuous employment. I submitted the required documentation. A form letter response arrived requesting the exact same information. I resubmitted the required documentation. Another form letter arrived requesting the exact same information. I had my employer send a version of the documentation with the requested information. I waited for a response. Waited more for a decision on my appeal. Continued to wait. Without health insurance and with a depleting supply of asthma medication. I didn’t believe I could return to the hospital to receive a prescription on the same pre-ACA sliding scale. On another call to the exchange call center to inquire about the status of the review, I asked if I would benefit from having a navigator assist me. The call center operator responded in the affirmative. Because I have worked with online systems and websites successfully for decades, I originally thought I didn’t need the help of a navigator. But my challenges weren’t located in the functionality of the website, they emanated from the system of policies, practices and procedures of the exchange. I located a navigator–the only one to answer the phone when I called–who happened to work at our local LGBTQI health center. She immediately appeared competent, knowledgeable and experienced in navigating the system. Now, I have someone who can work on the bureaucracy of obtaining my access to affordable health care while I attend events like the Conference on Current Issues in Lesbian, Gay, Bisexual, Transgender, and Intersex (LGBTI) Health Research hosted by Baldwin Wallace University (Berea, OH) with fourteen more puffs of relief medicine. 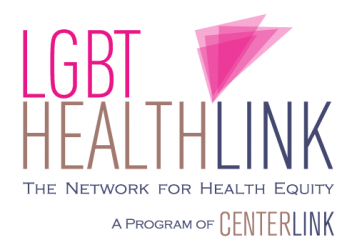 I am here on special assignment for the Network for LGBT Health Equity writing about the conference. The work of the ACA navigator on my behalf allowed me to sit a little more comfortably at Thursday evening’s reception hosted at the Rammelkamp Atrium of the MetroHealth Center here in Cleveland, OH. After opening remarks from conference co-organizer, Dr. Emilia Lombardi, assistant professor of public health at Baldwin Wallace University, Dr. Akram Boutros, CEO of MetroHealth, welcomed everyone and spoke about the progress MetroHealth has been making in becoming a workplace that is welcoming of sexual and gender diversity and a health care organization that effectively serves people of all sexualities and gender expressions with cultural competence. Afterwards, I spoke with Dr. Henry Ng, who leads MetroHealth’s Pride Clinic serving LGBTQI people in the local community. He shared with me a significant challenge to the work of the clinic; there is no industry standard for creating space for people to self-identify as LGBTI on medical forms. In addition to the ways this present absence hinders efficient data collection on who clinics serve–data collection that can lead to tailoring and improvement of services–but it has a direct impact upon clinical service providing in that gender designations on third-party billing forms can limit the kind of care provided to someone. For example, a transgender man who has a cervix will require care regimes that not permitted by the billing procedures unless a doctor designates him as female or some other cumbersome workaround the service provider creates. Dr. Ng expressed significant interest in ongoing efforts to address, what I consider to be, the embedded and manifest heterosexism and cisgenderism within health policy and systems that make it possible for people to remain unrecognized and unrecognizable within the bureaucracy. Friday’s schedule includes discussions about translating research into policy and health interventions; LGBTI health and population-level and clinical data; histories of LGBTI health research; and LGBTI health research education at the college/university level. Twelve puffs remain. It’s a bit embarrassing to admit how difficult it was to sign up for health insurance on the new exchanges. As a public health professional who’s trying hard to spread the word that people need to #GetCovered, I was trying to studiously ignore how every time I called there was some problem in signing up. Ultimately, it seemed to be related to my name change. Maybe it was more complicated because I only have a single name? I just hope every trans person doesn’t have to go through some of the hoops I did in proving they are U.S. citizens, because I know it delayed my enrollment by months. One of the myths about these health insurance exchanges is they are only for the uninsured among us, or only for low-income folk. Actually the exchanges offer a chance of better health insurance for many of us. For example, I was already enrolled in health insurance, but to my dismay it didn’t cover any testosterone, which left me skipping some months then finally shelling out $400/month through clenched teeth. Plus, my health insurance didn’t include dental coverage, so I carefully unclenched those teeth again. To be honest, I had to call the Rhode Island health insurance exchange probably eight times. First there was the complication of not living in the same state as my partner. While some private insurance plans would cover us both, the exchanges wouldn’t. Then they asked me to send in my drivers license and social security card to prove I was a citizen. So I scanned and uploaded them to the site then I waited for some notice it was ok to proceed… and crickets. It’s easy to put off enrolling like it’s easy to put off writing a will. Nothing bad is going on now, right? With three teenagers and a busy job, I had lots of other things competing for my attention. But once a month, as I shelled out that $400 for hormones, I kept remembering that maybe that insurance exchange could do this better? So I called back and filled out more of the application with the friendly person on the line. But now they needed to know how much my kids’ health insurance premiums were. Really? I am not the parent who pays them, so why did it matter? It stopped me again, until that $400 payment came again and I was motivated to track down the info and called back. This time, they needed even more information about my name change. I was definitely trying hard not to curse the insurance exchanges at this point. Remember, the party line is #GetCovered. Repeat until you believe it. Or better yet, go back and watch the hilarious SNL skit on the early website problems. I’ve watched it so many times now I can do a fair impersonation of their Sebelius impersonator. Ultimately, it was the coming deadline which moved me off my duff again. If people don’t get enrolled by March 31st, it’s see ya later until next year’s open enrollment period. So, I found my birth certificate, my legal name change document and uploaded them to the site. And voila — they finally admitted I was a U.S. citizen. I could choose a plan! But wait, the runaround stop didn’t stop there. I wasn’t going to sign up for another plan that didn’t include hormones. 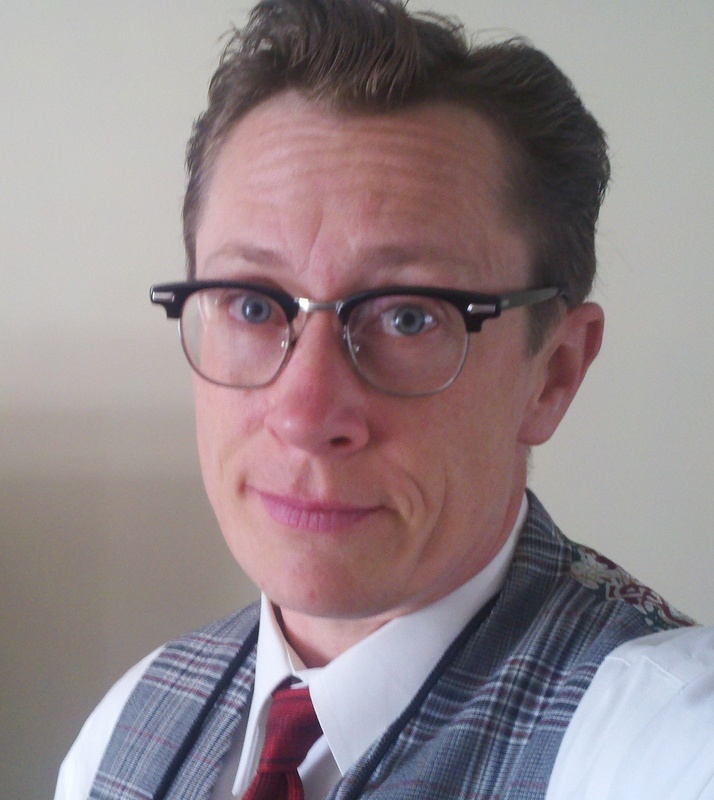 Plus, I needed to make sure my trans-friendly doc was in their plan. That took four more confusing calls, this time to Blue Cross. But everything was included. And I was going to get sweet dental coverage for the whole family too, including 50 percent of my kids’ braces costs. I signed up like lightning. I can’t lie; it was a total hassle for me to sign up and it could be for you too, but trust me it’s worth the hassle. I was cursing the insurance exchanges before but now I say bring on the new coverage as fast as it can come. Remember, we’ve only got until March 31st to sign up so spread the word. 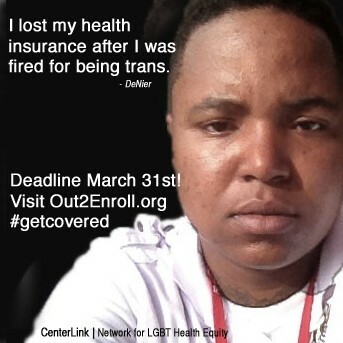 Visit Out2Enroll for more information and find more social media friendly images on the CenterLink Network for LGBT Health Equity blog here. 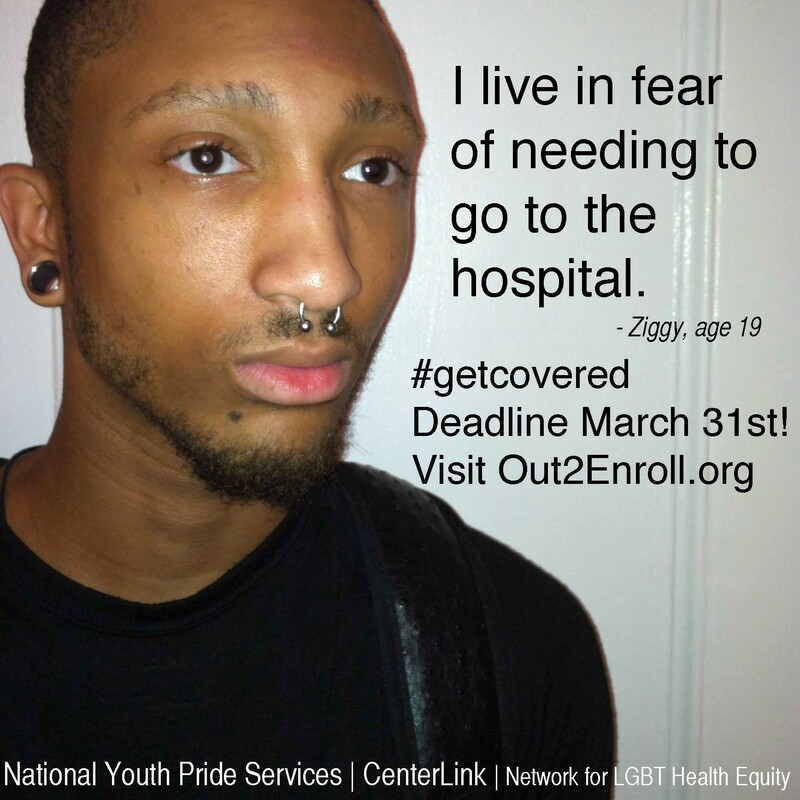 It’s Not Too Late To Get Covered! LGBT people make up for 3.5 percent of all Americans, bringing us to about nine million people. And, one in every three LGBT people don’t have health insurance (which is more than two times higher than the national average). 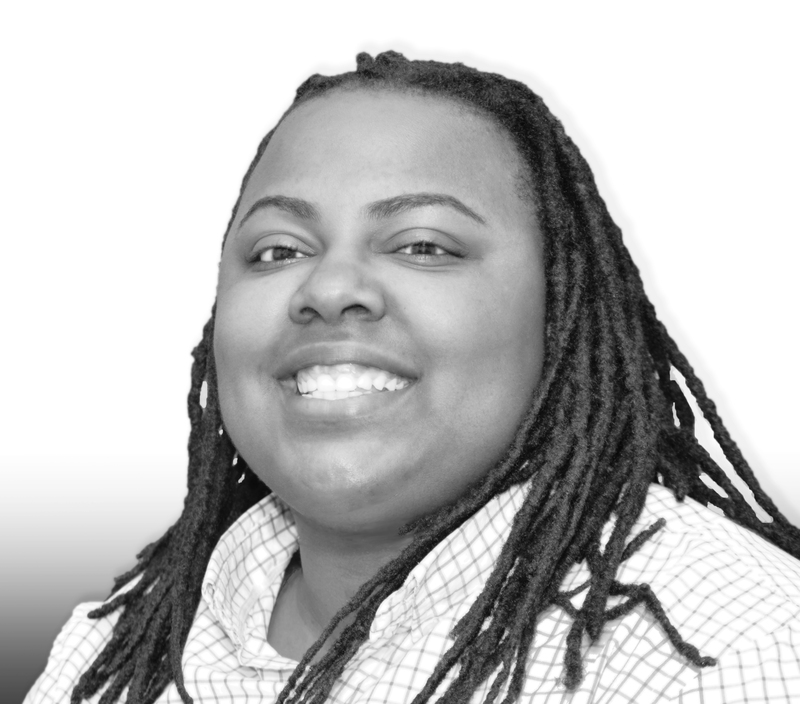 The many health disparities that LGBT people face, such as societal stigma, discrimination, and denial of civil/human rights, are some of the reasons that many of us lack health coverage. For example, 82 percent of uninsured LGBT people reported discrimination in the process of getting on the same plan as their partner. But, times are changing: “Have No Fear! ObamaCare is here”! ObamaCare, technically called the “Affordable Care Act”, or the ACA, is a (QUITE controversial) law, which ensures that all Americans have access to health insurance that is, just like its title says, affordable. the ACA was signed by President Obama in March of 2010, and went into effect Jan. 1, 2014. It makes affordable care possible by offering the consumers discounts or tax credits on government-sponsored health insurance plans, and expanding the Medicaid assistance program to include more people who don’t have it in their budgets to pay for health care. Oct. 1, 2013 marked the official launch of open enrollment of the ACA. In February alone, some 700,000 people have enrolled and since the official launch over four million people have signed up for the ACA. With the deadline around the corner it’s not too late to get enrolled. 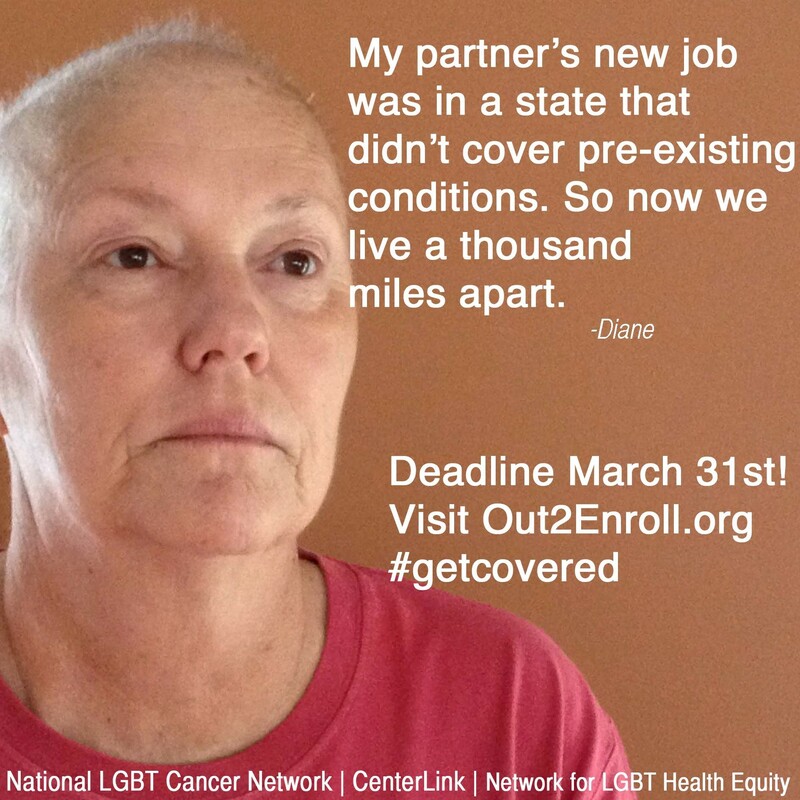 If you haven’t signed yourself up for health insurance, you still have until March 31, 2014. It is possible to buy insurance outside of the open enrollment period (ending March 31st, 2014) if you qualify for a special extended enrollment period due to a qualifying life event (such as marriage, divorce, birth or adoption of a child, or loss of a job). People who opt out of all health coverage options will have to pay an “individual responsibility payment” (either 1% of your annual income or approx. $100/year), and will also have to pay the entire cost of all their medical care (with no government subsidies). For more information on opting out, click HERE. The Affordable Care Act is not going to solve all the problems afflicting the health care system, and establishing care for so many previously uninsured people is bound to be complicated (and at times awkward). However, the ACA represents “one giant step for mankind”, toward addressing injustices in the health care realm, and connecting millions of Americans, including LGBT Americans, to the health care that they and their families need to live happier and healthier lives. No one can be denied coverage based on pre-existing conditions. Financial help is available to pay for a health insurance plan, based on household size and income. Check out these powerful images below, and feel free to download and share! 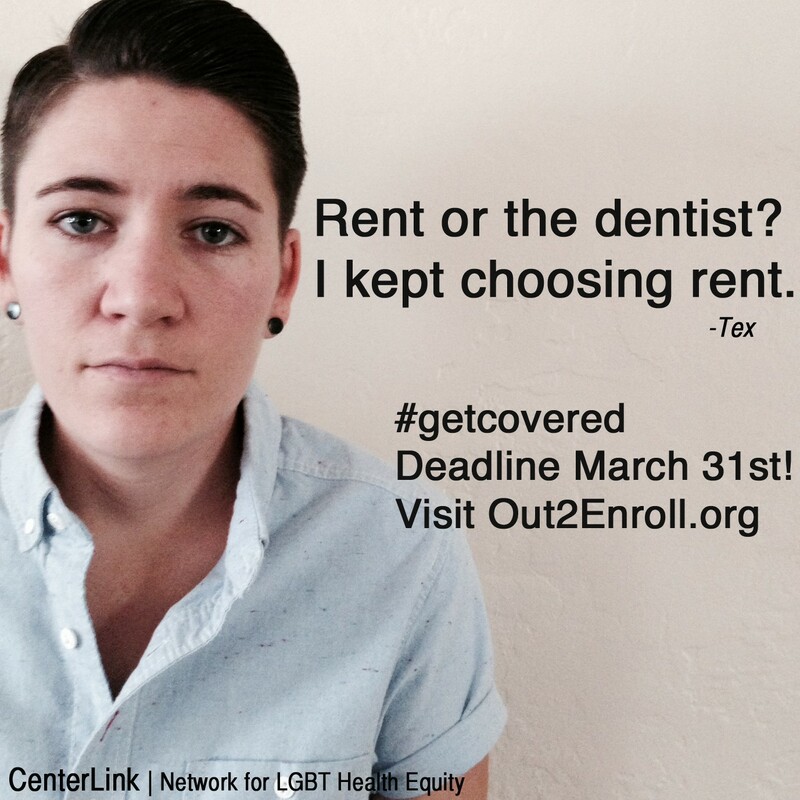 navigate ACA enrollment…call your local LGBT Center and make an appointment with an expert! It’s been a busy week with posting to the blog, but stay tuned, it’s not done. We still have a few more posts to finalize about lessons from the Tobacco & Diabetes Training Institute 2010, and today our team splits forces to head into 2 more meetings, I’ll be up in DC meeting with Secretary Sebelius and members of the new HHS Task Force on LGBT Health, while Gustavo and Emilia stay in Atlanta to attend the all-day tobacco disparity network planning day. So stay tuned for blogs on all. How did it start? I jumped into the cab to race to the airport and I think my cabbie warned me about his New York style driving but next thing you know he’s launching on a world class high volume rant about how we’re messing up health in this country. Crazy part was, he’s like a policy savant, nailing every single problem us fancy wellness folk are trying to prioritize. But change is afoot from top to bottom here. The passing of health care reform, also known as ACA or Affordable Care Act is setting some big pieces in motion to focus on wellness and prevention nationally. A large step is the creation of a new Prevention Council filled with cabinet members from all over government. And no, it’s not just filled with people from Health and Human Services, but with the head of the EPA, Dept of Transportation, Dept of Agriculture, etc. Folk realize we need changes at all these levels to clear the path to make it easy to be healthy in our country. Nicely, in the first report of this council, they are also naming sexual orientation (crossing fingers for gender identity soon) as a disparity population! So, I’m looking forward to this new top level coordination to change systems and the from-the-getgo inclusion of LGBTs. I know they’re putting together an attached community advisory council, I sure hope we have LGBT health experts on it. And I think we should have Eldin too!